How do unionists respond to the SNP's Alex Salmond? Perhaps the best option is to bring on an independence referendum sooner rather than later, writes Ed Jacobs. When the former Scottish Labour leader Wendy Alexander called on the SNP minority government in Holyrood, to “bring on” a referendum on independence in 2008, it caused Alex Salmond and his party colleagues to panic. For the first time, a party committed to the union challenged the standard bearer of independence to bring forward the legislation needed for a referendum and have the argument they wanted. In the end, the SNP failed to take that opportunity for a referendum, and ended the parliamentary term having been forced to withdraw their proposed legislation providing for one. Fast forward to today, and the winning of an outright majority in the Scottish Parliament by the SNP has led to Westminster recognising the right of the Scottish people to vote on their future constitutional arrangements in line with the SNP’s manifesto commitment. However, the battle now rages over when to hold the vote. For the SNP, the plan, as things stand, is to have a referendum in the second half of the parliamentary term , with Alex Salmond arguing that his government’s immediate priority will be to increase the powers afforded to Holyrood within the Scotland Bill, currently going through Westminster. The SNP’s case therefore is really premised not on prioritising greater powers for the Scotland Bill but on seeking to capitalise on the growing unpopularity north of the border of the Conservative-led government over the cuts being imposed on Scotland. And it’s not just political grievances that the SNP will be seeking to exploit, with news that the Scottish cabinet is to consider measures to prevent the UK Supreme Court ruling on issues in Scotland following the case of Nat Fraser. So how do those in favour of retaining Scotland as part of the UK respond? On the assumption that the Cameron-led government is not going to undertake the u-turn needed on its economic policies, perhaps the best option is for those in favour of the union to do as many have now called for and bring on an independence referendum sooner rather than later. While the SNP would no doubt cry foul over such a move as being somehow contrary to the expressed views of the Scottish people, the fact remains that their manifesto (page 28) pledged only for a referendum with no indication of timing. Therefore, their calls for a vote in the second half of the current parliamentary term in Scotland have no electoral mandate at all. Such a move would have two distinct advantages. Firstly, it would avoid the next four years in Scotland being dominated by constitutional navel-gazing at a time when jobs and investment in the public sector should be the priority; secondly, it would force Alex Salmond to make the case for independence, based not on grievances with London, but on a positive argument for an independent Scotland. A positive argument for example, which at one point included his case that Scotland could form part of an “arc of prosperity” of smaller independent nations such as Ireland and Iceland, countries which have found themselves in the abyss of economic and financial crises. But for those who feel the case against independence has yet to be fine-tuned, we have only to look at the arguments made by those outside the traditional pro-union movement for the reasons why independence is unlikely to work. “The SNP’s victory in the May elections… Means that the party can now fulfil its commitment to push for a referendum on independence. But independence, if achieved, would bring complications – both political and economic. The reality is that Scotland would gain little by full independence. And equally, on the totemic issue of defence and foreign affairs – a key area to marking out any nation as being independent – Jim Sillars, the former SNP MP and long standing champion of independence, used a recent article for the Scotsman to argue for a sharing of Scotland’s defence and foreign policy with the UK. “I can understand the Scots’ desire for a greater degree of independence but when you really stare down the barrel of complete independence and providing for their own security, I am not sure they would want to do that. In essence, therefore, both economically and from the point of view of defence, a clear case can be made against independence on areas of policy that go to the heart of what independence for Scotland would mean; arguments far more complex than the simplistic message that Scotland would be better off without the Tory-led government in Westminster. But for a campaign against independence to work properly, it will be crucial to identify someone with the stature and credibly to lead and take on the politically astute Alex Salmond. While reports in the Daily Mail following the devolved elections that Gordon Brown was being lined up to lead the campaign against Scottish independence have received short shrift in some quarters, in many respects it would be an astute move. Firstly, although politically shallow, his unpopularity with Mr Cameron could prove an asset in any campaign in Scotland; secondly, and probably more potently, it would provide the platform needed for him to make a simple case, namely that it was the UK government, led by him, that bailed out and prevented from going bust the Scottish banks HBOS and RBS, something which could not have been achieved by an independent Scotland. “In these fragile economic times, this distraction risks the recovery, risks investment, risks jobs, risks prosperity and risks the wellbeing of the country we all love. When the banks failed, Labour stepped in to protect the jobs, the homes, the mortgages of millions. Whilst the choice of Gordon Brown would no doubt prove controversial and draw criticism from much of the Westminster elite, that, in many ways, is the point. A fight against independence cannot be led or controlled by London. It must be a Scottish campaign, led by a well established and well known Scot and being portrayed as being slightly aloof and outside the Westminster mainstream would be unlikely to do him any harm whatsoever. And so, with support for such a move from those as far apart politically as Alistair Darling and the last Conservative Scottish secretary Lord Forsyth, an early referendum on independence could prove the best option to address the Queen’s recently reported concerns over the break up of the UK. Yes it might face the wrath of Alex Salmond’s anger, but ultimately if an early referendum were to be called, he would be forced to spell out a positive case for Scottish independence rather than simply capitalising on grievances with London. If independence for Scotland really is such a good idea, what would he have to fear? After all, he spent much of the last parliament preparing for the publication of a detailed White Paper which outlined the SNP’s case for independence. It is time for those who support the union to have the courage and the unity to embrace a debate on Scotland’s future and call on Alex Salmond to “bring it on”. The Scots wont vote for independence as they need to feed off the English tax payers subsidy. Maybe we could have an English referendum and make the decision for them. Wendy was immediately slapped down by Gordon Brown for her “bring it on” call. The only panic on view was that in the Labour Party. And now SNP Government has turned off the second salary tap for Labour councillors in Glasgow, they won’t be that concerned when the SNP take control of the city at the elections next year. Why did the SNP win? Because they offer a positive programme for Scotland that chimes with the needs and wants of the people in Scotland. Independence will happen; the relationship between Scotland and England is going to change radically. Rather than stand in the way of history, the left in England should put their abilities towards using the change as an opportunity to make a better England. Bring it on? 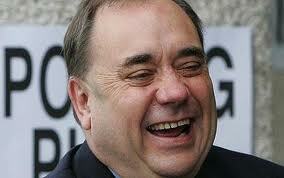 Does anyone think that a savvy politician like Alex Salmond hasn’t got a plan B for such an eventuality? Cameron calling a referendum would absolutely guarantee a victory for independence. Yes bring it on, Scotland will do well enough without England. You are deluded. England floats on Scottish oil. Just got it. It’s fundament spelled backwards. How appropriate for such a comment. When you mention ‘Scottish’ banks how come they are Scottish would it be because they have Scotland in their names, Scotland yard must be ours then. John Kay says nothing other than his own assertion much like Michael Fish in 1987. England does not subsidise Scotland but it also does not steal Scotlands oil. The union is far more balanced than both English and Scottish nationalists are prepared to accept. It would be very bad for all parts of the UK if the union ended and so the separatists must be defeated. It is right that the referendum needs to be called by the UK parliament and held within the next couple of years, rather than letting salmond hold one in 5 years time with rigged questions when there may be a conservative majority government and labour in even more disarray than now. NewsnetScotland is a pro independence bias propaganda site. If there’s one thing guaranteed to make more Scots vote “Yes” it’s having Westminster interfere in the referendum. What an incredibly one sided argument! You provided a plethora of comments against independence when there are plenty of other experts who are FOR independence. Failed to mention a single one of them. Are you forgetting who deregulated the banks in the first place which caused the banks to gamble the way they did? That’s right, GORDON BROWN. This is supposed to be a left wing blog, are you forgetting who the furthest left major party in Scotland is? The SNP! The best way to a greener, more left wing Scotland is through independence. The last general election and Holyrood elections show just how different our political opinions are to England. @Simon Wright and the BBC is a pro unionist propaganda site. So your point is? England does not subsidise Scotland but it also does not steal Scotlands oil. Treasury officials also advised that the boundaries of Scotland’s coastal waters should be redrawn and a new sector created to “neutralise” Scotland’s claim to North Sea oil – a step that was taken. Read the McCrone report buried for 30yrs by Westminster. Do not really see what all the fuss about the timing of a referundum is about. If there are clear arguments from both sides to be made about a centuries old union what difference will this year or five years time make? I am more than a little confused by the coherence of the argument in the articles concerning defence. Firstly it states that an SNP member is advocating shared defence responsiblities between the remaining UK and independent Scotland. Then it argues that an independent Scotland couldn’t fund it’s own defence. Which I got the impression nobody was suggesting?!? Nice to see the usual, racist, anti-Scottish comment and bias on here. Anyone who thinks Scotland is subsidised by England, rather than the reverse is delusional. The information is now all freely available, and the grab of territorial waters by the Nu Liebour machine in 97/98 doesn’t get much more transparent. The Unionist parties will sit and wait like good little boys and girls, primarily because Labour is the only UK party with anything substantial left to lose in Scotland, and in MiliEd and which ever numpty they chose from the survivors to “lead” in Scotland (i.e. follow incompetent Ed’s orders, he had much to do with the defeat in May as everyone saw that Gray’s boss was an even bigger idiot than him) they have no ability to set the political agenda. Meanwhile Cameron and Clegg are stuck between indifference and an inability to act. Seriously, this article could’ve been lifted straight from the Daily Mail. Can’t believe this site is anti-SNP. You claim to be fighting for a sustainable economy, public services for all, good society and multilateral foreign policy. All of these are core to what SNP stand for. I’m English but admire the SNP more than anyother party in British politics today. They do not campaign positively for a progressive country, making Scots think not what Westminster does for them but what they can do for themselves. Honestly think it’s a shame that typical little-Englander feelings of jealousy towards the Scots can find their way into a left-leaning website. Its not scottish oil,its in uk waters,if scotland goes it alone it would still be crown water and to top it off its extracted by english oil plc so no scotland would not get much money from oil. Also scotland will lose its defence contracts,its ship yards will close without uk defence holding it up and aircraft carriers n naval ships will be built in english n welsh docks.They will also lose defense bases and how will scotland be able to pay for a NHS n free education n councils not to mention the bank bailout they could no way afford on their own. I am totally opposed to the breakup of the union, and so I hope people vote no. This is seriously deluded and desperate stuff. Gordon Brown? Aye, right. PMK – Racist? Please. It’s 2011 – grow up man. The revenue in the United Kingdom is primarily generated in the South East of England – that’s what keeps the tenants in Easterhouse eating their deep fried Mars Bars and breeding on such a regular basis. Regardless I do agree that Scotland should have Salmond’s referendum and since he is the best politician in Scotland (and certainly better than any individual Labour MP anywhere) I hope he wins. Put this referendum to the whole of the UK and Scotland will go independent I guarantee because when Scotch politicians have the cheek to vote on English laws that don’t affect them then it’s time to rebuild Hadrian’s Wall and keep the Jocks on the other side of it. Mr Mouse – how dare you suggest that most income is generated in SE England and then redistributed assymetrically through the Barnet formula. That would imply some positive aspect to this country from the bankers and other City workers – such alien concepts are not tollerated on this site. How dare you refer to those in the City as ‘workers’! While those who prevent people getting to work, such as Bob Crow and his merry band, may rightly be so-called, those who work extremely long hours and pay punitive amounts of tax may not. You clearly didn’t get the memo. #18, nothing else to call this anti-Scottish bias. Your own post shows you subscribe to such RACIST views: deep fried mars bars, bashing the inhabitants of Easter House, and rebuilding Hadrian’s Wall (English citizens north of the wall will be particularly interested in that) … referring to people as “Jocks” … well done: no racist you! You are an embarrassment to your fellow countrymen and women, and whatever political organizations you chose to associate yourself with! Roll on Independence, when you and the small-minded racist idiots like you are truly in a foreign country. The English left should be very worried as to what happens when the UK breaks up: its too late to save the UK, Scotland is already heading to the independence lifeboat … and you’re welcome for the last 30 years of largesse from Scotland’s oil revenue, its the last thing you’ll get from north of the border for free! FYI – on principle neither the SNP nor Plaid Cymru votes on purely English matters, check you facts and take your medication. ‘an early referendum on independence could prove the best option to address the Queen’s recently reported concerns over the break up of the UK’ Oh yes and that’s all any of us care about isn’t it? How pathetic. Salmond said in the election manifesto when the referendum would be and they won’t change that. If Cameron tries to pre-empt and control the referendum it could spectacularly backfire on him, he won’t do that. If unionists want the Scottish people not to just want to head for the hills and jettison a cobweb-ridden political system that delivers Eton Tories at Numbers 10, 11 and as mayor of London, an unelected second chamber and a hereditary monarch as head of state at the apogee of this antediluvian fiasco – bring democratic mandate to the second chamber and the head of state. Otherwise England might be Ruritania by itself because a lot of people are losing patience with it. I was previously undecided, but yep this post has finally persuaded me. I will be voting YES. As a poster stated previously, this article could be lifted straight from the Daily Mail, an article full of the age old myths and scaremongering perpetrated by the UK press. Bring back Broon, Darling and the particularly toxic Forsyth, would only benefit the yes campaign, who would represent a throw back to the past. As for getting Cameron involved? With a whopping 1 Scottish MP, what mandate does he have to force Scotland into an early referendum? As for worrying about the Queen. Come on. Do people really still give a Tam Kite about her concerns? England rules Britain by oilgarchs that stay in power by brainwashing societies. Typical scare mongering, anti-SNP article here. The same kind which led to the Scottish Labour party failing so spectacularly in the elections. The Scottish people are smarter than that. Throw Scotland out of UK more for the rest of the country. No more social services more jobs forthe rest etc etc. I would guess that the Scots, who are a pretty smart bunch, would figure a way to survive on there own. But politicians being the sleazy bunch they really are, I would also guess that the referendum will never happen. Much like the UK politicians who promised then renaged on a European referendum, they will look at the impact on themselves, their own income etc. and quickly decide that regardless of what may be good for the country, it isnt in their own best interests. To get elected politicians promise anything, but deliver very little that isnt directly connected to their own pockets. On the positive, at least Salmond isnt the windbag and self serving politician that the likes of the Kinnock clan have turned out to be. Unless Salmond sees himself getting his nose into the European trough. Lets watch this space.